This Australian mineral makeup ( natural makeup), CHIARA 3 is suitable for medium to dark skin tone. No Chemicals! No Titanium Dioxide! Made with natural sunscreen and organic essential oils. Availability: In stock Category: Mineral Makeup. 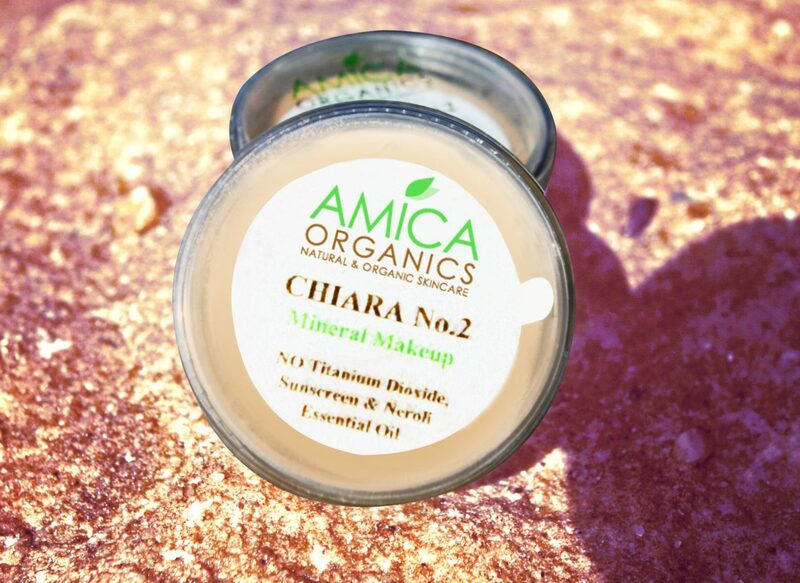 This unique Australian mineral makeup (natural makeup) known as CHIARA 2 is great for women with a fair to medium to dark skin tone – ideally suitable for someone darker than olive skin. This mineral makeup gives facial skin a real natural and beautiful glow. This product is very unique as it does not include the natural mineral Titanium Dioxide, which is metal derived. AMICA Organics were not comfortable with the controversies over Titanium Dioxide used in mineral foundations and therefore have decided to remove this ingredient from our Mineral Foundations. This product also has Zinc Oxide which is a sunscreen ingredient (however this product has not been tested for SPF) and contains organic Neroli essential oil, which is known for its sedative properties for the skin and has a beautiful aroma too. Photo for Chiara No 2 will be updated soon. Thank you for your patience. This mineral makeup can be used by someone with a fair to medium skin tone. Apply CHIARA after applying ROSINA or SERENITY. It can be applied as a powder using a brush or as a cream mixing it with a little ROSINA Organic Anti Aging Serum. To use as a cream, simply add a half a pump of ROSINA with the mineral makeup and mix well before applying on your face or under your eyes.